WOCinTech Chat/FlickrDon’t do this in your next interview. Corey Salzer, who was hired at Amazon right out of college, said leaning too much on your team’s accomplishments can alienate recruiters during the interview process. They want to know what you did in your previous roles – not what your job title was, or how famous your company is, or a laundry list of your job requirements. 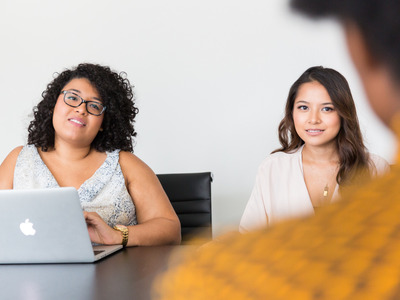 “Titles are great, but we want to understand what was the project you owned, what was the scope of a project, and what did you accomplish,” Celeste Joy Diaz, the recruiting manager for university programs at Amazon,previously told Business Insider. Corey Salzer, who graduated from the University of Washington in St. Louis in 2017 and started working at Amazon right after, agrees. When she gives advice to others about how to get a job at Amazon, she said it’s important to emphasise what you did as part of a team or company. “If it kind of comes out in part of your interview where maybe you were part of a team and you’re really only talking about the accomplishments of the team and not necessarily your individual contributions and what they did, I think that’s something that can hold people back,” Salzer, who is a solutions architect at Amazon Web Services, told Business Insider. Instead, make it clear that you were a key contributor to your company. Emphasising your individual accomplishments in a team is a key way to sway hiring managers. And it’s not just Amazon recruiters who want to hear about the fact that you can take charge of a project and lead it. Tina Nicolai, executive career coach and founder of Résumé Writers’ Ink, previously told Business Insider that it’s important to define your accomplishments with numbers. When making your résumé, expand upon what you did in that job that brought value – whether that’s an amount of revenue you produced, projects you led, or how you excelled in your monthly goals. Including the numbers that back up your success is key. Be as specific as possible. Write, “Helped grow revenue by 500% to $US1 million in 12 month period by doing X” instead of “Helped grow revenue,” Nicolai said. In the interview, it can be more tempting to speak with less specificity. You might end up discussing your company, general job description, or what your team does. But it’s still crucial to emphasise how you were a leader within the company – not just another cog.